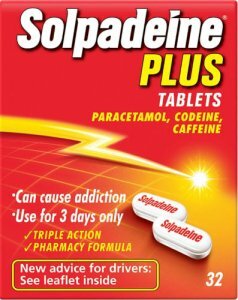 Solpadeine Plus Tablets provide effective pain relief with a combination of paracetamol, caffeine and codeine. Solpadeine Plus Tablets contain the active ingredients paracetamol and codeine, which are both analgesics (painkillers). By working on your body in different ways paracetamol and codeine combine to relieve pain. Caffeine acts to help the effectiveness of paracetamol. 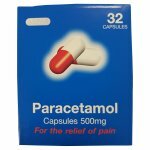 Paracetamol also has an antipyretic effect (helps to reduce temperature when you have a fever). Solpadeine Plus Tablets provide relief from migraine, headache, backache, rheumatic pain, period pain, toothache, neuralgia, sore throat and the fever, aches and pains of colds and flu. Take 2 tablets every 4 hours as required. Solpadeine Plus Tablets should not be taken if you are sensitive to paracetamol, codeine, caffeine or to any of the other ingredients listed above. 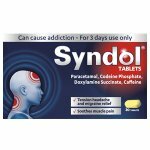 You are taking metoclopramide or domperidone- used to treat nausea and vomiting. You are taking colestyramine- used to treat high cholesterol. You are taking anti-coagulants (drugs to thin the blood e.g. warfarin) and you need to take a painkiller on a daily basis over a long period. However, you can take occasional doses of SOLPADEINE Plus Tablets. Please see your doctor before you take this medicine if you are pregnant. You can take SOLPADEINE Plus Tablets whilst breast feeding. Medicines can affect the unborn baby. Always talk to your doctor or pharmacist before taking any medicines in pregnancy. KEEP ALL MEDICINES OUT OF REACH AND SIGHT O CHILDREN. Paracetamol 500 mg, Codeine Phosphate Hemihydrate 8 mg and Caffeine 30 mg, Maize starch, soluble starch, potassium sorbate (E202), polyvidone, purified talc, magnesium stearate, microcrystalline cellulose, stearic acid.